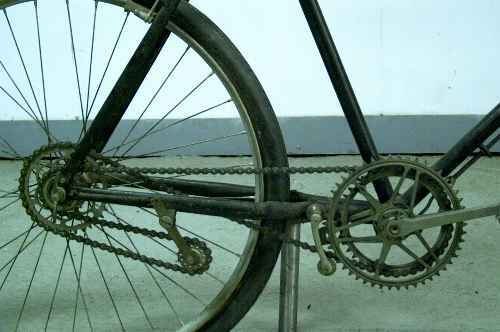 When tootling around the internet on a day off, I came across an amazing set of photos of an old bicycle's gearing system. Since it's on a Dutch company's website I suspect it has not been seen by too many people here in Oz. So have a look and see if you can figure out the way this works. Hint - the bike had four gears. 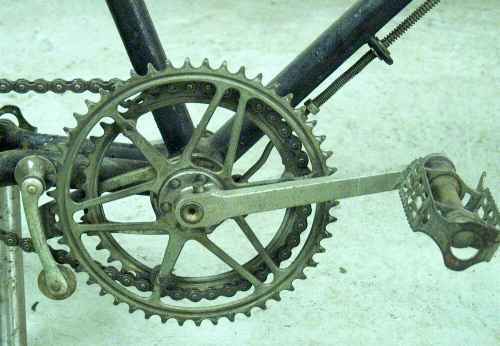 A verbal description of the chain path: top of front chain-ring to bottom of front chain-ring to top of large/low gear at rear to bottom of large/low gear at rear to small cog hanging from chain-stay to bottom of small/high gear at rear to top of small/high gear at rear to top of front chain ring again. But before we get to the really weird bit, a look at the front, where the chain can be changed between the two front chain rings. It's a little different from the modern method, but recognisable. The little doobie on the left moves up or down to shift the chain onto the small or large ring. 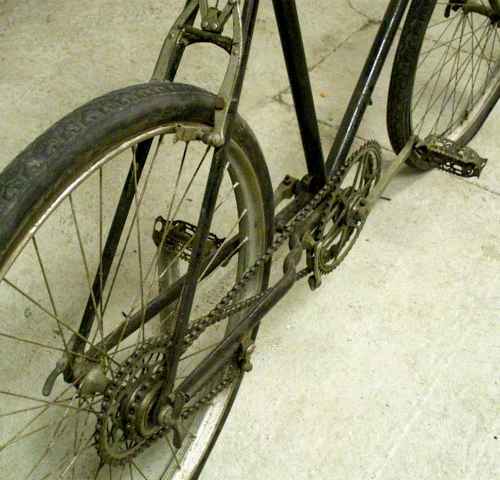 When you pedal forward the chain pulls high gear (the small cog on the rear). The chain will still move the large/low gear, but it doesn't do anything - it's just idling over, not engaged with the wheel. When you pedal backwards (yes!) the chain engages the low gear. The bike still goes forward, but you have to pedal backwards. In this case, the small/high gear just idles over not engaged with the wheel. How's that? Amazing. Ingenious. And, my guess is, very strange to ride.